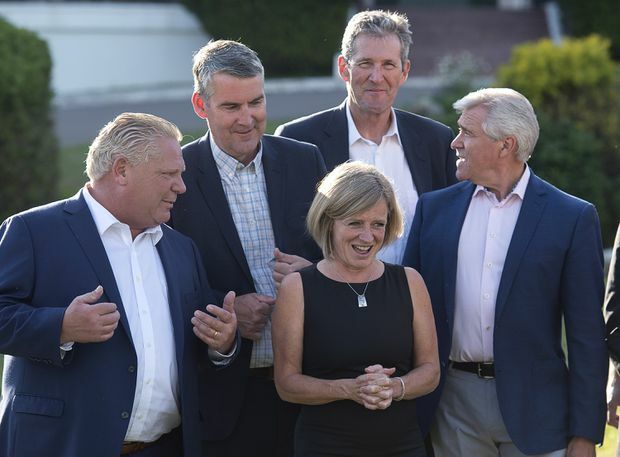 From left, Ontario Premier Doug Ford, Nova Scotia Premier Stephen McNeil, Alberta Premier Rachel Notley, Manitoba Premier Brian Pallister and Newfoundland and Labrador Premier Dwight Ball chat as they wait to take the official photo at the meeting of Canadian premiers in St. Andrews, N.B., on Wednesday, July 18, 2018. Ontario Premier Doug Ford is using his first appearance at a gathering of premiers to assemble a national coalition to fight the federal government’s climate plan in court, setting up a direct challenge to Prime Minister Justin Trudeau. Less than three weeks after his swearing-in, the rookie Progressive Conservative Premier has taken his province from a stalwart supporter of carbon taxes to a fierce opponent, upsetting the balance on the issue that Mr. Trudeau reached with premiers more than two years ago in Vancouver. That deal led Ottawa to pass legislation this year that will impose a national carbon tax in provinces that have not set up an equivalent carbon-pricing regime. Mr. Ford is scrapping the cap-and-trade system his predecessor introduced, and now wants to stop Ottawa from imposing a carbon tax on Ontario and other provinces that don’t want one. Along with Saskatchewan, which has already promised a legal battle against any federal carbon tax, Mr. Ford will court other provincial leaders at the meeting who might become allies in a showdown that could end up at the Supreme Court. “Premier Ford is not sitting back on this,” Ontario Environment Minister Rod Phillips said on Wednesday. “He’s going to be in New Brunswick, talking to other premiers – the meetings are arranged – talking to them about the plan to chop this Trudeau carbon tax. It’s important to this country." Manitoba’s Premier told The Globe and Mail on Wednesday his province is not interested in joining a court fight. Mr. Ford was to meet with Saskatchewan Premier Scott Moe on Wednesday evening. “It’s a changing environment,” Mr. Moe said of the provincial political landscape. Premiers began arriving at a seaside resort in Saint Andrews, N.B., with a wide range of pressing issues on their minds in addition to the climate file. Before the meeting, various premiers said they want to discuss pipelines, federal equalization payments, a national pharmacare plan, cannabis legalization, immigration and reducing internal trade barriers. But a provincial response to the federal climate-change legislation will be among the most pressing items on the agenda. The Ford government expects to table environmental legislation later this summer to repeal the cap-and-trade system former Liberal premier Kathleen Wynne introduced. During the election campaign, Mr. Ford promised to spend $500-million over four years to increase inspections of major polluters, invest in new technology and reduce garbage in city parks. Saskatchewan launched a constitutional challenge earlier this year arguing that the federal government does not have jurisdiction to impose a federal carbon price. Mr. Ford has indicated he wants to join that case or launch a similar one. In an interview with The Globe, Mr. Moe said the Ontario election results and recent comments from the PEI government questioning Ottawa’s climate plans suggest there is growing concern from provinces. He said new carbon taxes hurt Canadian businesses at a time when they are concerned about staying competitive with the United States, where Washington has cut U.S. taxes and imposed tariffs on imports from Canada. “We will have a good discussion on competitiveness, including ineffective policies such as carbon taxation, of which province after province seems to be coming to that realization as the deadlines loom,” he said. New Brunswick Premier Brian Gallant, the summit host, has not said the province intends to challenge Ottawa’s carbon tax plans in court. New Brunswick’s climate change plans include using revenue from the province’s existing gasoline tax, a move that Environment Minister Catherine McKenna has criticized. British Columbia, Alberta and Quebec remain as large provinces that have already adopted a carbon price and support the national plan. However, Quebec’s Liberal government is trailing in the polls with an election coming on Oct. 1. Alberta Premier Rachel Notley’s NDP government faces a vote early next year, and her chief rival, Jason Kenney of the United Conservative Party, is a staunch carbon-tax critic. Supporters of a national price on carbon have said it would give governments the social license to approve new pipelines, but B.C. and Alberta are bitterly divided over the planned expansion of the Kinder Morgan pipeline, which Ottawa agreed to buy earlier this year in an effort to ensure it goes ahead. Manitoba’s fiscally conservative Premier, Brian Pallister, told The Globe he will not join Ontario and Saskatchewan in taking Ottawa to court. Mr. Phillips made his comments on Wednesday as he hosted his first formal meeting with his federal counterpart, McKenna. The federal Environment Minister did not pass up an opportunity to take a shot at Ontario’s Progressive Conservatives, saying they “don’t seem to have a plan” to tackle climate change. The challenge for premiers will be to achieve any cohesive decisions by the time the gathering wraps up on Friday. Mr. Pallister said he’s hoping the concern over rising protectionism around the world will push the premiers to finally act on eliminating the many trade barriers that still exist between provinces. “We’ve got a real opportunity here to take barriers down that really shouldn’t have been there,” Mr. Pallister said. With a report from Jack Hauen in Toronto. Editor’s note: New Brunswick has said it believes its carbon-pricing plan meets the requirements of the federal government. Incorrect information appeared in an earlier version of this story.